Portable Power Banks, Wireless Chargers, Travel and Home Chargers, Cables, Etc. All USB ports of this charger are optimized to charge your smartphones, tablets, Bluetooth headphones, power banks, e-readers, portable speakers, MP3 Players, digital cameras and any device that charges with a USB cord. •Smart Flow Technology - All 6 ports are equipped with Smart IC chipset, which recognizes your connected devices and delivers the most efficient and safe charge for your device, intelligently and efficiently. Declutter your desk by replacing multiple chargers. Simultaneously charge up to 6 devices at full speed using this 60 Watt Six Port Quick Charge 3.0 Desktop USB Charger. Designed to work with all USB-powered devices. Charge compatible devices up to 4x faster than conventional charging with Quick Charge 3.0. Built-in safeguards protect your devices against excessive current, overheating, and overcharging. This 20,000 mAh power bank is the powerful portable charger that provides a stable power supply and conveniently keeps your iPad, tablet, iPhone, smartphone and more charged up and ready to go. Including a wide variety of smartphones, tablets, and more - so you can stay connected on the go no matter what you're carrying. This 20,000 mAh battery pack delivers up to 11 smartphone charges. Enjoy protection from overheating and overcharging. Delivers a safe and reliable stream of power. Provides at-a-glance battery life percentage information. High Speed Dual USB Ports charge two devices at one time including higher amperage devices like tablets. This compact and travel sized wall charger makes for convenient and space saving charging with 4 standard USB ports to charge 4 devices at one time. The foldable prongs make it easy to throw in a bag for travel and the compact size takes up little space. No cords or cables allow for the charger to be directly plugged into a standard wall outlet. The smart charge technology routes the correct amount of wattage to each device to allow for maximum charging for that particular device and only gives it what that device can support. This allows for the correct and highest amount of energy to go to each device that is charging. More power hungry devices will be assigned more power while the lower wattage devices recieve less power. All USB ports allow for charging of all devices including tablets, smart phones, iPhones, iPads, iPods, Android phones and tablets, bluetooth headphoens and speakers, book readers, MP3 players, Victor Readers, etc. Each USB port allows for charging of higher amperage devices as well as the lower amperage ones. Please Note - 10 Watt wall adapter needed to make full use of Fast Wireless Charger Stand charging capacity (iPhones charge at no more than 7.5W). Keeps phone in place while charging or using it as a docking station for viewing (compared to our competitor's more glossy finish and slippery design, the "rubberized" non-slip texture feel provides a much better grip between smartphone and charging stand). Whether you use the charging stand as a charger or as your smartphone's desktop / tabletop stand (docking station), the angled and slanted design helps keep your smartphone balanced and prevents tilting. •CONVENIENT PHONE STAND W/ GREEN ILLUMINATING CHARGING LED LIGHT - This unique phone stand design incorporates a non-slip rubberized surface to an already durable, strong stand. This allows the device to stand straight up for perfect video chat calls. •HIGH-QUALITY DESIGN - The design of this stand was made with the user in mind. A strong centralized base of the wireless phone charger secures your phone in place. The durable materials used to make the phone add an extra layer of security and stability to your charging station. •FASTER CHARGE TIMES - Our centralized wireless charging receptors allow our W3 model to charge up to 10% faster than most 5W charging models. The chargers are also case friendly so you never sacrifice convenience for usability. •INTELLIGENT PROTECTION TECHNOLOGY - Exclusive Multifunctional Intelligent Protect Technology provides temperature control, surge protection, short-circuit prevention, and more. To get the best experience and quicker charging times, we recommend taking off the phone case and removing other metallic materials from the stand. •COMPATIBLE WITH QI ENABLED DEVICES - The Qi charging method is compatible with most Qi enabled devices including: Apple iPhone 8/8 Plus/10/10S/10S Max/10R Samsung Galaxy S9/S9 Plus/S8/S8 Plus/S7/S7 Edge/S6/S6 Edge/S6 Edge Plus/Note 9/Note 8/Note 5 - Nexus 4/5/6/7 (2nd Gen) - Nokia Lumia 950XL/950/920/928/930/830/1020/1520 - HTC Droid DNA/8X (not UK) - LG G2/G3/G4 (int. version) - Sony Z3V. Use this wireless charge pad to quickly charge your new iPhone 8, 8 Plus, or any of the new iPhones. Also compatible with any other devices that can wireless charge with QI technology. A large round and thin pad gives you ample space to set your device on, and the soft top of the pad keeps your device from getting scratched. Incredible 100 plus hour playtime powered by a built-in 10000mAh Li-polymer battery. With built-in solar technology, this Solar speaker converts and stores solar energy from sunlight for emergencies and for outdoor use. Enjoy your music in 10 Watt stereo sound through dual high-performance drivers and superior enhanced bass performance. This bluetooth speaker can also be used as a 10000mAh power bank. Simply plug your phone or tablet into one of the dual USB charging ports on the Bluetooth 4.0 Speaker and it will charge your device while playing music. This awesome speaker can even charge two devices at one time. Compatible with all Bluetooth-enabled devices. Instantly connect to your smartphone or tablet from up to 50 feet away. The speaker reconnects automatically to the last device used. With the on board controls on top of the speaker, you can adjust volujme, play/pause music, and skip forward or backwards your music tracks. The easy to locate and feel indented buttons make operation a breeze. The included micro SD card slot allows you to play your MP3 music direct from the speaker and control the tracks with the speaker controls on top. This compact portable solid aluminum speaker contains dual speaker drivers for real stereo sound. Powered by 5 watts of power each, for a total of 10 watts, the music sounds incredible from such a small speaker. Charge the speaker with the included micro USB cable or take it outside and let the sun do the work for you. The whole back of the speaker is a huge solar panel for charging and storing energy in the battery for later use. 3.5mm Headphone jack for private listening. With this quick charge 6 foot USB type C to Apple Lightning charging cable, you will never want to go back to another lightning cable again. With its heavy duty braided nylon covering and it's super fast charging speed, it is the only charging cable you will ever need. Charge an iPhone 8, 8 Plus, or any of the iPhone 10 models 50 to 60 percent in 30 minutes with this cable and a high wattage charging block. One end of this cable plugs into a USB type C port while the other plugs into an Apple lightning device. Use at least a 30 watt USB type C charging adapter to take advantage of the quick charge capability. Even if you have an older iPhone, this cable will charge it much faster. This is a great addition to one of our portable batteries that have a USB type C quick charge port. Ultra-fast transmission speed up to 480Mbps-transfer an HD movie or 1000 songs every 10 seconds. Perfect compatible with iPhones, Macbooks Macbook Pro, or the new iPad Pro models. ①Ensure a maximum charging speed up to 5V 2.4A 12W. 5 Port Super Capacity Rugged 30,000 mAh Portable Battery With Fast USB Type C Charging and Ability to Charge 5 Devices at One time Including New MacBooks, Tablets, Smart Phones, Bluetooth Devices, Etc. The world's Toughest External Battery Pack and the most cost-effective battery pack. Charge up to 5 devices at one time with this amazing and super rugged power bank. With a huge 30,000 mAh capacity, you can charge your devices for weeks! With the tough and rugged rubberized shell and the rubber plugs for each port, you can take this power bank with you into the wild or just across town. It's outer shell protects the battery from water and drops. Charge a single device 10 to 15 times before ever needing to recharge. With the included USB type C cable, you can charge this power bank almost twice as fast than if you were using a micro USB cable. With the bidirectional charge of the USB type C port, you can charge devices twice as fast and charge the battery almost twice a fast. And with the other 4 USB ports, you can charge 4 devices at once and throw the USB type C cable in the mix and that makes 5 devices at once. This is the only power bank you will ever need! Take it with you to the beach, a trip, a hike, a cruise, or just across town. This battery has you covered! Everyone could find themselves in a natural disaster and this power bank is ready when you need it. Who needs electricity when you have 30,000 mAh of power! Charge iPhones, iPods, iPads, MacBooks, MP3 players, Bluetooth speakers and headphones, Victor Streams, tablets, Android phones, and anything that uses a USB port to charge. Note: Please connect to the power bank first and then the device when using the type-c cable to charge. Charge an iPhone 8 or 8 Plus, or any of the new iPhones 50 to 60 percent in only 30 minutes with the USB type C port. This 18 Watt Quick Charge USB Wall Adapter is nice and compact and will charge your USB devices 50 to 75 percent faster. Easy to carry in a pocket, purse, or bag, you can easily carry one with you wherever you go. •High Efficiency: Qualcomm Quick Charge 3.0 Certified, World's advanced charging technology, 4 Times faster than traditional charger, 1.4 Times faster than Quick charger 2.0. •Multi-voltage Compatible: 100-240 Volt 50/60Hz input, ideal for worldwide travel. •Supreme Compatibility: Backwards compatible with all versions of Qualcomm Quick Charge technology(such as QC2.0,QC1.0), also can charge non-Quick Charge technology devices. This USB type C cable offers extraordinary charge and sync rates. Fully supporting Qualcomm Quick Charge 2.0 / 3.0 / 4+ and other high-speed USB chargers with speeds up to 3 amperes (5V). Data transfers up-to 480mbps (USB 2.0). Technology combined with world-class components and material choices results in unrivaled durability with 15.000+ bending tolerance. Twist them in and out, throw them off a rooftop, even roll over them with your office chair and they will still work. Plug the USB type C connector in any orientation. Worlds sleekest tip, only 4.75mm enabling use with ANY protective case and ridged side-grip for superior handling haptic. Color-coded to differentiate use among family members or devices. Including cable organizers for adjusting the perfect length or easy storage. All USB type C cables are built on proprietary DualHousing™ technology to firmly fix connector and isolate bending movements resulting in Minimum 2x longer lifespan than any OEM Stock Type-C cable. Available in 3 foot, 6 foot, or 10 foot. Make your choice from the drop down box before adding to cart. Grab this 45 watt quick charge kit for your iPhone, iPad, or iPod and charge your items faster and with less waiting. The 45 watt USB type C wall adapter along with the included 6 foot USB type C to Apple lightning cable allows for the fastest charge of any of your Apple devices. Charge your iPhone 8, 8 Plus, X, 10R, 10S, or 10S Max 50 to 60 percent in only 30 minutes. Charge other models of iPhones, iPads, or iPods 20 to 30 percent faster. The included 6 foot cable is a tangle free durable nylon cable and is a USB type C to Apple lightning cable and will provide the fastest possible charge for your Apple devices. Equipped with power delivery, this USB type C charger will provide your device with the fastest and most efficient available current. 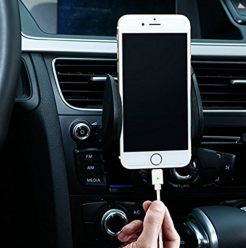 The product is manufactured using only the best industry-grade materials and premium circuitry which, when combined with the product's intelligent design, offers full protection against bumps and knocks, as well as overheating, over current/voltage and overcharging, for safe, efficient, and hassle-free charging. Charge devices with the included USB type C to Apple ightning cable and get the fastest charge out of your iPhone, iPad, or iPod. USB Type-C charging port or Thunderbolt 3 (USB-C) charging port and support up to 45W Power Delivery (PD) charging for PD-enabled USB-C devices. Intelligently detect your device and delivers the optimal current to connected devices. Support smart output for QC 3.0 enabled USB type C devices with an input voltage of 5V-12V. With a maximum output of 5V/3A, 9V/3A, 12V/3A, 15V/3A or 20V/2.25A. Meet new Level VI energy efficiency requirements of DOE. USB type C Wall Charger has a foldable plug and is easy to put in your bag when you go to work, travel or just at home. A compact build and design allows you to take it with you anywhere. This kit is compatible with any iPhones, iPads, or iPods that use an 8 pin lightning connection like the iPhone 5S, 6, 6S, 7, 7 Plus, 8, 8 Plus, X, 10R, 10S, and 10S Max along with the newer iPads like the iPad Air, iPad Pro, iPad minis, etc. iPods include iPod touch. The 45 watt wall adapter along with a USB type C to USB type C cable (not included) is compatible in charging the new Macbooks. Durable materials, resisting high temperature. Intelligent design offers full protection against overheating/ overvoltage /overcharging. This kit includes 1 45 watt USB type C wall adapter and a 6 foot braided nylon USB type C to Apple Lightning cable. Monster Power Protects your Home and Family. Power surges can be serious. Not only could you lose your home entertainment system and home office electronics -- you could lose your home. Standard surge protectors account for 37 percent of all home electrical fires. Protect your electronics from storms and surges with Monster Power. You've made a serious investment in your home entertainment system, not to mention your home. Either one or even both can be wiped out in an instant. At a minimum, a surge can reduce the lifespan of your electronic equipment. Sending a sudden jolt of electricity, it can easily short out--destroying all in the process. Only Monster has FireProof MOV Technology that protects more than just your electronics, but also your home and family. Is your equipment and your home at risk? Common events like storms can cause a dangerous surge, permanently damaging your electronics in the process. Even if your current MOV is UL-certified, it could still catch fire. What exactly is a Power Surge? A power surge is a brief spike in your power or TV cable line usually caused by thunderstorms, changes in the power load from appliances going on and off, or problems with your local utility company and the like. Yes, because we encase our MOV's in a specially engineered ceramic material that will not catch fire during a power surge, making it your best defense against fire. Monster Power Protection is equipped with Monster FireProof TMMOV Technology. Better Sound and Better Picture. The power in your home is subject to interference or noise that can be seen and heard on your system. Our surge protectors include Monster Clean Power technology to help ensure that your components perform at peak levels. Each of our surge protectors is backed by a connected equipment warranty. If any equipment properly connected to one of these devices is damaged by power surge we will replace the damaged equipment. The Monster surge protector must be in use as instructed. This Maxell Portable Bluetooth Speaker has a Built in Power Bank. Just plug your mobile device’s charging cable into the speaker’s USB port and get an extra charge of power when you’re away from home. The small flat design allows for easy transport and has a built-in microphone for hands-free phone calls. This Mini Board connects with mobile phones, computers, tablets, iPods or any other Bluetooth devices. The NFC technology allows for one touch pairing and the radiator technology provides a deep clean bass. This is an extra USB Type C tip to replace or add to the 5 foot magnetic cable package that we sell. These tips will only work with the 5 foot magnetic cables that we sell. This is an extra 5 Foot magnetic Cable to replace or add to the 5 foot magnetic cable package that we sell. These cables will only work with the 5 foot magnetic tips that we sell. will only work with the 5 foot magnetic cables that we sell. This is an extra micro USB tip to replace or add to the 5 foot magnetic cable package that we sell. These tips will only work with the 5 foot magnetic cables that we sell. These magnetic cables and adapters will be the last cables you will ever need. Safely charge your devices without fear of damaging the plug or cable if accidentally and suddenly pulled on cable or device. Fast charging speed - Ensure a safe charging at 2.4A Maximum and the speed of data sync up to 480 Mbps.. The cable has a durable Nylon Braided design with an aluminum alloy connector which makes it easy to survive everyday usage and gives it a more stylish and elegant appearance that goes great with your expensive devices. Compatible with micro USB and Apple 8 pin lightning devices. 8 pin lightning plug is Apple MFI certified so no accessory not supported messages. Use only one cable to charge all your devices. Leave the charging tip plugged into your devices without continuously plugging and unplugging the charger and eventually loosening and damaging your device's charging ports. Note: Extra cables and tips are available in our store to purchase separately. BlueTooth and Wireless Speakers, Headphones, Keyboards, Headsets, Etc. Wired Headphones, EarPhones, Speakers, Etc. Computer Related Audio, Drives, Storage, Card Readers, USB Hubs, Cables, etc. Home, Bath, and Kitchen Items, Insulated Mugs, Jewelry, Bags and Backpacks, Etc.